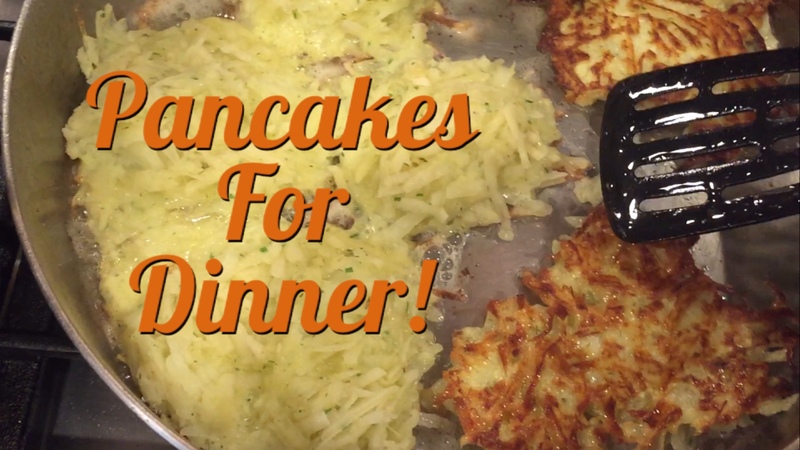 Homemade hash browns or potato pancakes are great for breakfast, lunch or dinner. The only thing that prevents me from making these everyday is the time it takes to shred or grate the potatoes. Surely you could use a food processor with the correct attachment, but we’re rocking the kitchen old school with a hand or box grater. Once you grate your potatoes, the rest is easy. Peel and grate potatoes. I put them in water to keep them from browning. Drain well. Add eggs, spices and garlic. Mix well. Cook immediately. The potatoes will sweat, so cook them quickly before your mixture is soaked in liquid. Indeed by the end, you’ll notice a lot of liquid. Be sure to drain it before cooking, but also remember that a lot of the flavor is being lost in all that liquid. You can try salting the potatoes after you cook them to keep them from sweating so much water. Cook them on medium to high heat with a enough oil to sizzle the edges of the hashed browns. Leave them until they have browned well (depending on temperature, it could be 3-5 minutes). If the temperature is too high, you’ll over brown them, but the inside won’t be cooked thoroughly or will be very moist. If the temperature is not high enough, you won’t get good browning. Flip them and continue cooking. Once fully cooked and browned, remove them to a wire rack or paper towel. Eat them hot! Not too hot of course, you don’t want to burn yourself, but they won’t taste as good if you let them cool. To reheat, pop in the oven for less then 10 minutes covered at 400 degrees. Then refry them to crisp up the outside. This recipe was inspired by the November 2013 issue of Better Homes and Gardens. Why do I have a magazine clipping from back then? Well a while ago, I had the brilliant idea of purging my magazine collection (if you want to know how i got a magazine collection, keep reading), but keeping all the articles I liked. So I spent quite some time perusing the magazines cover to cover and tearing out the things that interested me from recipes to home decorating pictures to projects. I three-hole punched them and slipped them into a binder. Then they sat in the school room for some time. On rare occasions, I would flip through it and think, “Oh yeah, I want to try that recipe,” or “Oh right, I wanted to do that project.” Did I do that project or make that recipe? Nope, not in all that time…until now, that is. While cleaning out the school room at the close of the year, I opened up this binder and committed to making these potato pancakes.They were soooo good!! Oh my, with some garlic, salt and spices, they were the perfect warming addition to our tomato soup. Now my kids ask for them often. And if they want to grate the potatoes, I’m all for making them! So why the huge magazine collection with included five different magazine titles? Well back in 2012-2013, we moved temporarily to Texas for nine months. I knew it was a temporary move from the start. We took only what fit in our van and lived the most minimal of a minimalistic life. At the same time, I saw a promotion for five magazine subscriptions for a ridiculously low price. I thought this would be the perfect thing to look forward to receiving in the mail during our nine month stay in which I choose not to have a social life (that’s another story), Indeed receiving the magazines throughout the months was both exciting and motivating. But then I had all these magazine to deal with! After taking what I wanted from them, I gave them to a friend who eventually donated them when she was done. So that’s my magazine story. 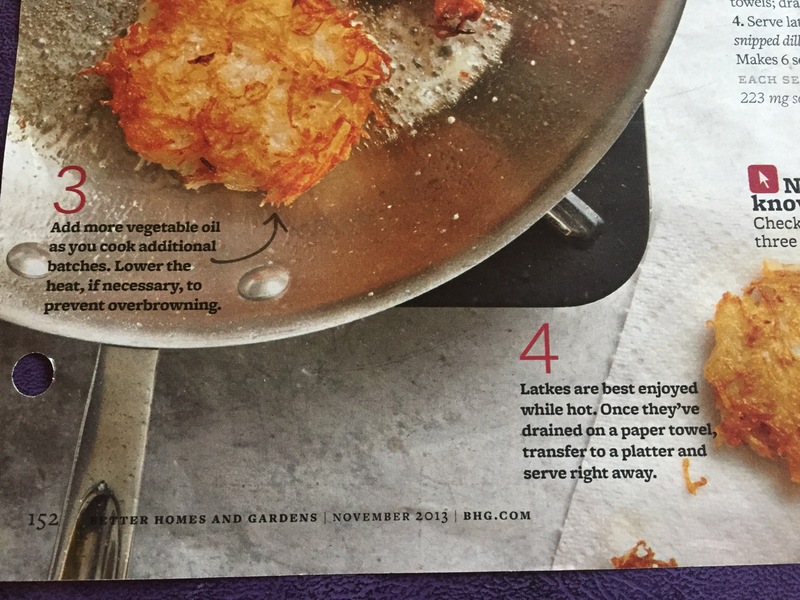 I’m about to cancel my only remaining subscription, Martha Stewart Living. It’s been a thrill getting them over the years, but it’s time to actually put them to go use. I’ll keep the ones I have but look over them when the month comes around again. So back to this post! If you want to see the perfect side dish/soup recipe to accompany these potato pancakes, check out my super simple, pantry-to-the-rescue tomato soup recipe. Check out more food recipes, including my favorite, pizza puffs, by clicking on the playlist here.